Does it surprise you to learn that window boxes are back “in”? You read that right! Just as beards and knitting have made a resurgence in popular culture, the humble window box is back and it’s not just an old fashioned begonia holder anymore. Window boxes are small-space, vertical planters that provide the opportunity to garden even if you don’t have a lot of room. I’m always up to plant something new, but alas, I have no window box. I have windows (lots of them, luckily), but there isn’t one that has the right fit for a window box planter. The front windows are just above a bench that would be unpleasant to sit at with a planter hovering over your head. The back of the house’s windows are on the second story and the windows open outwards, both making gardening there difficult. But just as Goldilocks kept searching for just the right thing, I went on the hunt for a vintage wood window (thank you Craigslist!) to fit a cedar planter box I had in my garden shed. Hooray! 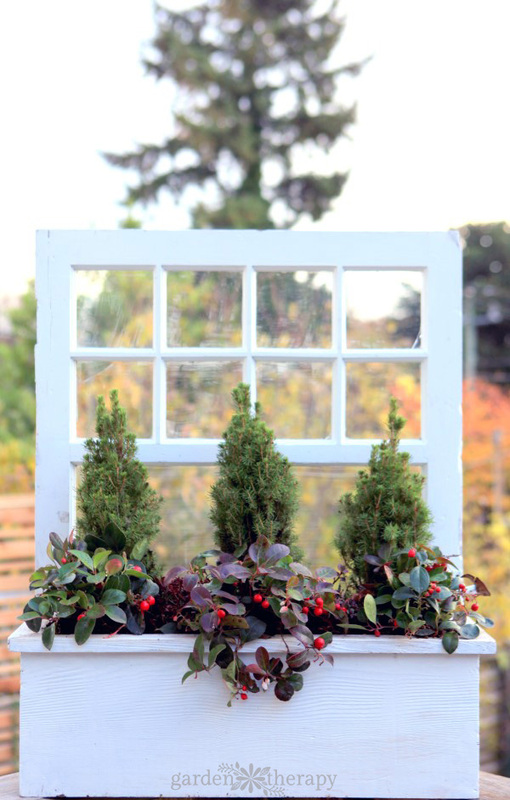 These two easy pieces make the most charming winter window box planter and add a focal point to my deck. 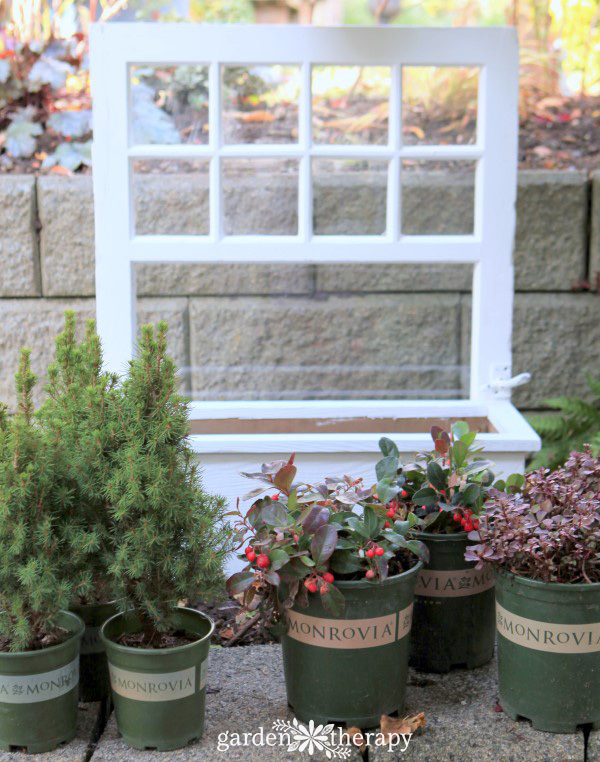 First I will show you the steps to recreate this simple DIY project, then keep reading to see some of the great plant combinations I chose to last throughout the winter. Sponsored content: This post is sponsored by my besties over at Monrovia, who also provided me with the plants for the project. We also have a Shop.Monrovia.com giveaway happening now. You can see the details at the end of this post. Read on my friends, it gets even better from here! Can you imagine my luck? 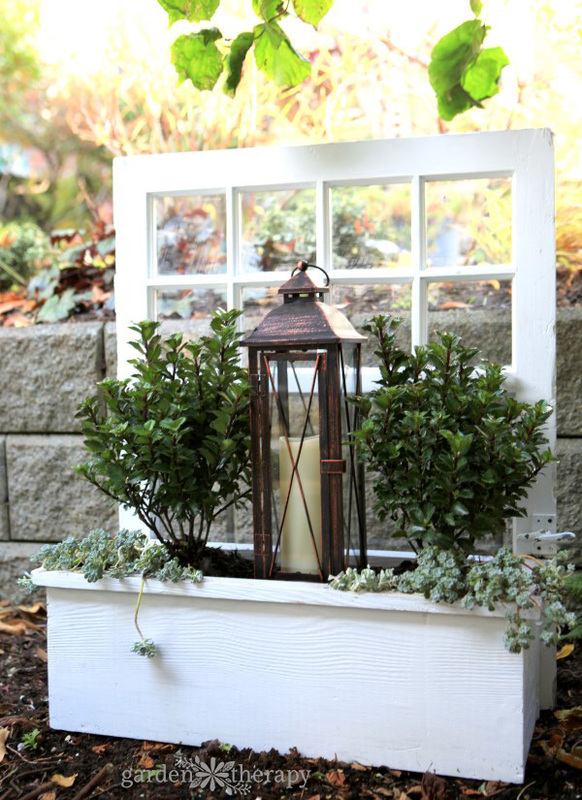 The cedar window box that I had in the garage was the exact dimensions of the vintage window I found on Craigslist! I’m not completely certain this is luck though, as both were 24” long and likely that is a standard size for both a window and a window box planter. My hope is that it’s as easy for you to find the supplies as it was for me. The cedar planter has a decorative lip on it which prevented it from sitting flat up against the window. 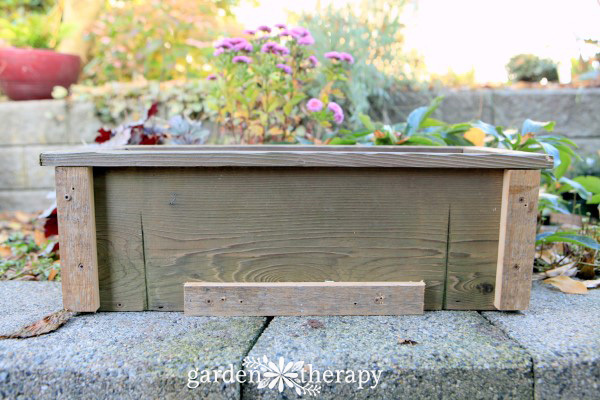 A scrap piece of cedar board attached to the back of the planter acts as a shim that allows the window and box to fit together like perfect puzzle pieces. Use a power drill to attach the shim to the box, and then attach the box to the window. 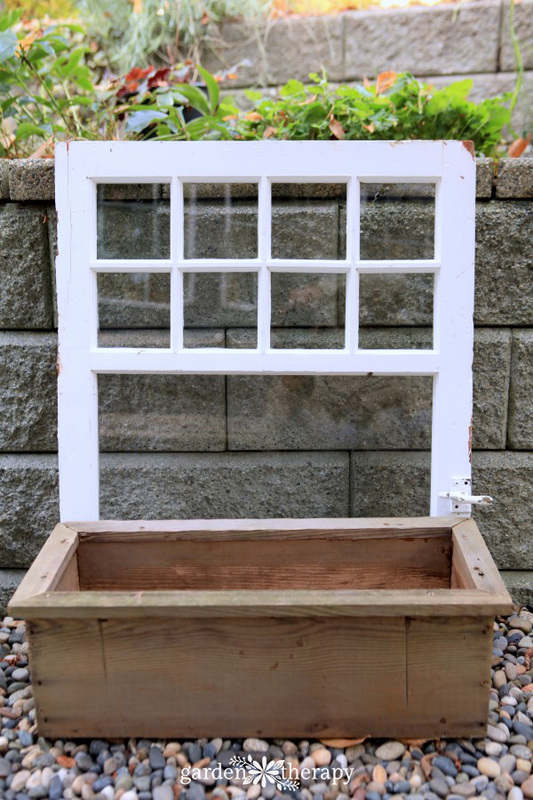 Then give the box a coat or two of exterior latex paint to match the window. That’s it! A seriously simple project. Now let’s get to the planting. 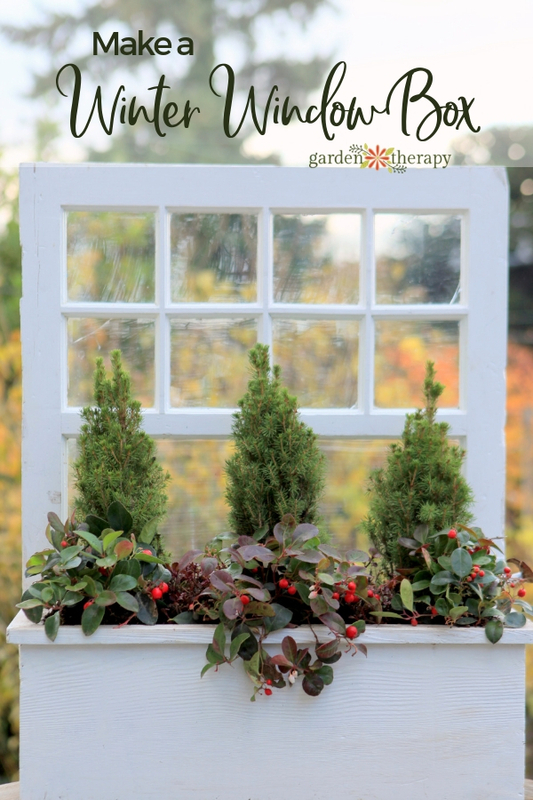 I had a lot of fun trying to decide what to plant in my winter window box. I love the idea of adding live plants and those that provide winter interest. Here are some great choices from Monrovia. Tiny Tower Dwarf Alberta Spruce (shown above) is a small variety of spruce that has a dense, pyramid shape perfect for topiaries. When young, it has bright green foliage that turns to a gorgeous shade of grayish green when it reaches maturity. Very Berry Creeping Wintergreen‘s (shown above and left) glossy green leaves turn to a deep, beautiful purple in the fall. 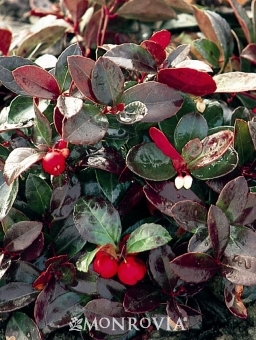 It has small white bell-shaped flowers in the summer and fragrant bright red berries in fall and winter. Dragon’s Blood Stonecrop (shown above) has deeply dramatic purplish green leaves and bright crimson flowers. This groundcover performs well in containers as well as in rock gardens or as a border plant. Cape Blanco Stonecrop (shown below) has stunning evergreen silvery-white foliage that gets a lavender tinge as the temperature drops. It produces sunny yellow flowers in the summer. Bonus: the foliage is edible! 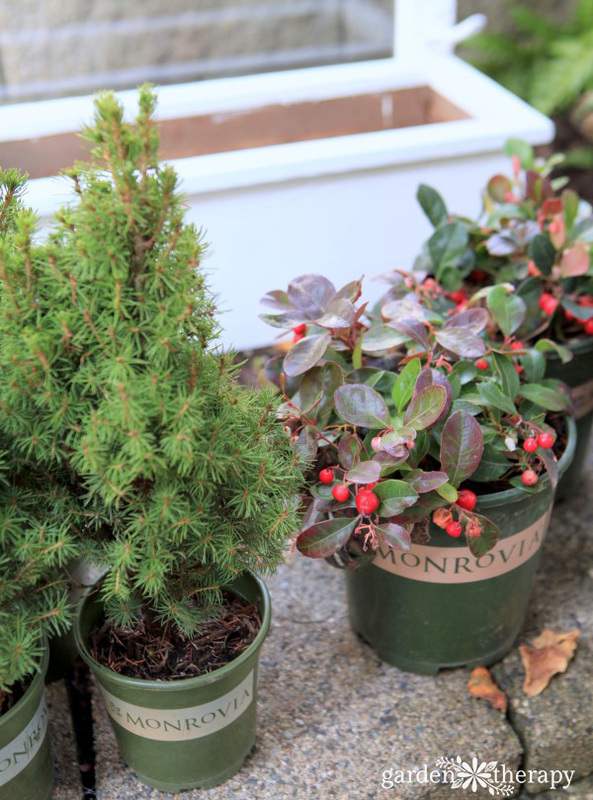 Scallywag Holly (shown below and right) is a round-shaped holly bush with dense, glossy green foliage that gets a burgundy tinge in the cooler seasons. 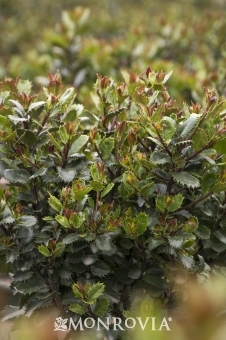 Scallywag is evergreen and disease resistant. Georgia Blue Speedwell (not shown but worth a mention) is a lovely groundcover in the summer when the little blue flowers cover the entire plant. 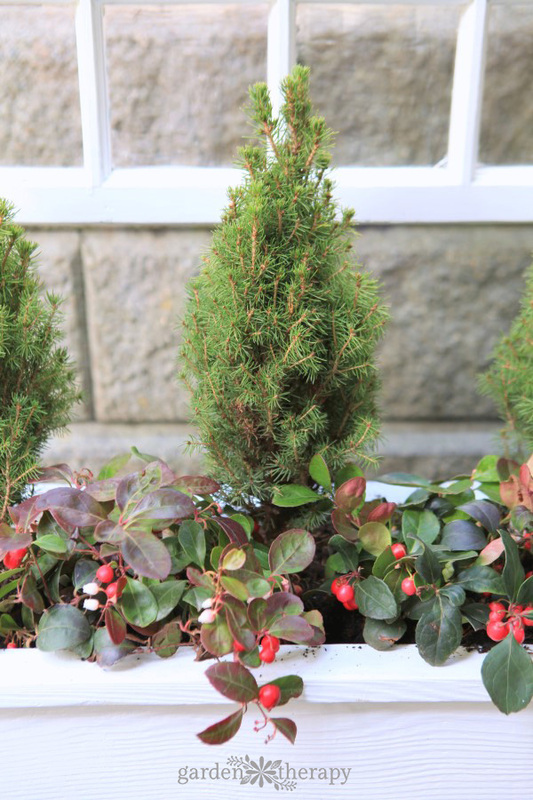 In winter, this gorgeous evergreen turns a bronze-purple color that makes it perfect for year-round interest. I tried out a few of these combinations to see which one I liked the best. This one with the Scallywag holly, Cape Blanco stonecrop, and a battery-operated candle was beautiful, but I wanted something I could leave outdoors and not fuss with all winter. The candle would need to be removed whenever it rained, and since that is pretty much every day in the winter, I redesigned the window box. I ended up with three Tiny Tower dwarf Alberta spruce planted with festive Very Berry wintergreen, and moody Dragon’s Blood stonecrop. 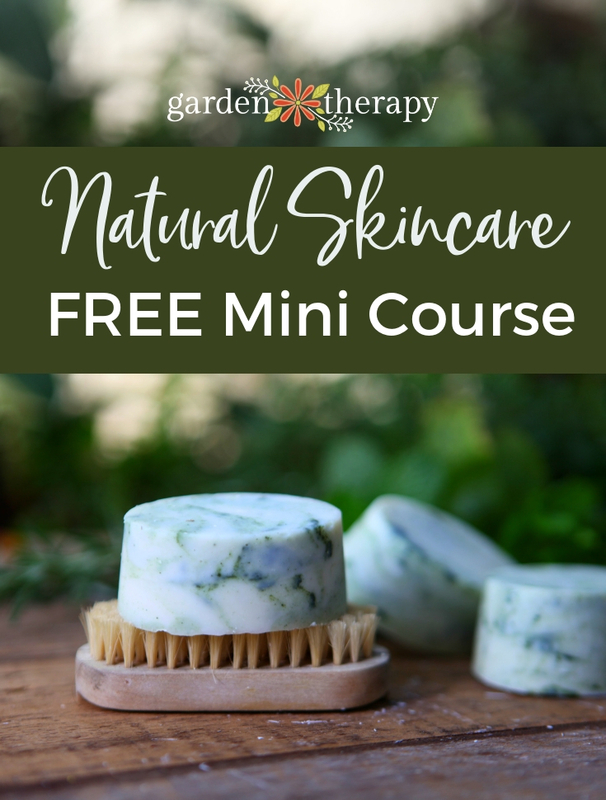 I love the result and know that it will look great all winter long, with minimal effort from me. As the temperature drops, so do care needs. If you have chosen plants that are suitable for your zone and provide winter interest, you have done 90% of the work already. 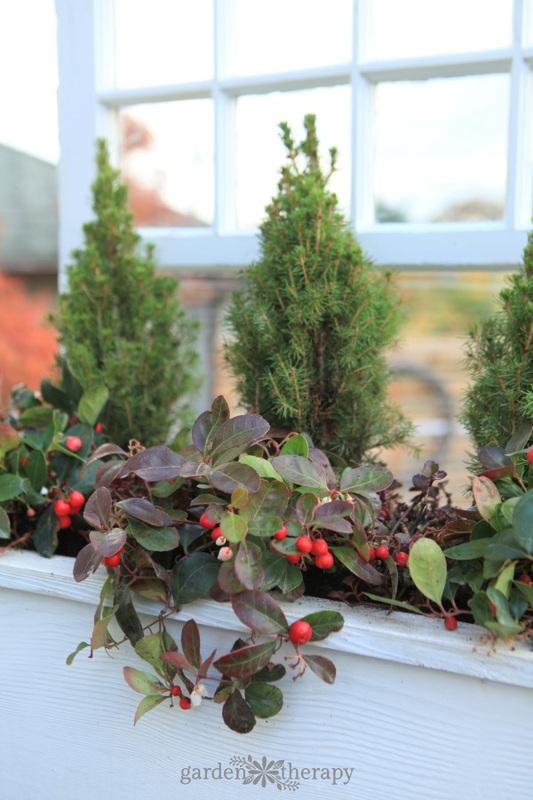 Cold climate gardeners should choose winter container plants that are at the full size that you want them, as they won’t grow in cold weather. If you are in a warm climate, continue to care for the plants as directed on the plant tags. If you live in a colder climate where the soil freezes, then you will provide limited water in the fall before the temperature drops, and won’t need to water in the coldest months. They will hunker down for winter and continue to look fabulous during the season. 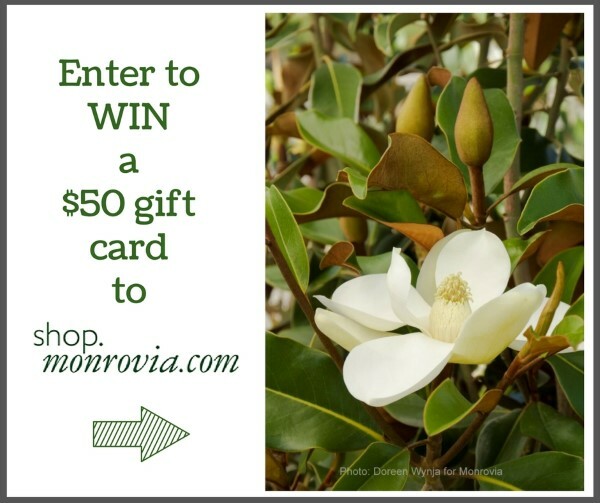 We are currently giving away a $50 gift card to shop.monrovia.com so you can pick out just the right plants for your own window box! This contest is now closed. 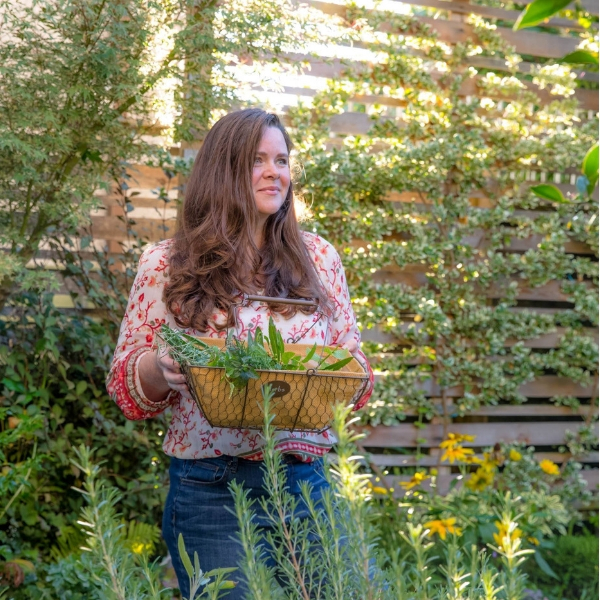 Want even more winter garden ideas? Check these out! Beautiful! Brilliant idea for our cold winters! Merry Christmas Stephanie! I love this project as it has great eye appeal and fairly simple to do. What a great idea!! love it! 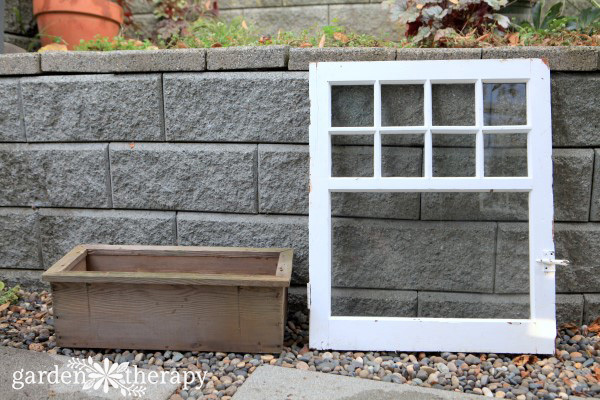 i have such a hard time planting for small spaces…this would help me get started!